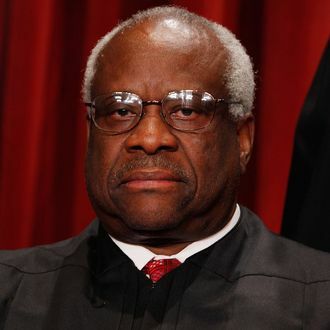 Two weeks after Antonin Scalia fell silent, Clarence Thomas has made himself heard. After ten years without issuing a single question from the bench, the Supreme Court Justice interrogated the Justice Department’s lawyer for several minutes in a hearing Monday morning, the Associated Press reports. The questions came in a case on the constitutionality of barring those convicted of domestic violence from gun ownership. Among Thomas’s inquiries was whether the government believes that it has the power to suspend the constitutional rights of any other category of criminal. Thomas’s unbroken silence had been an object of derision in liberal circles. The justice had previously defended his taciturn approach by saying that he relied primarily on written briefs.